On Twitter someone suggested posting a picture of something you love on Valentine's ... 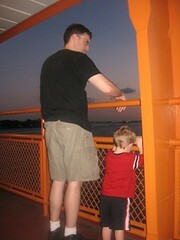 I couldn't remember my Flickr password to share this one of my Valentine husband and sweet baby nephew - on the Staten Island Ferry last summer. Aren't they CUTE?! My precious moo - hoo's.